In this post I announce the publication of my latest book (I think that makes it twelve in various stages of release). It’s a book that exposes misconduct from the owner and Editor-in-Chief of Samoa’s leading newspaper. The book contains a copy of all communications, blogs and legal documents including a $2m defamation case against me. This book is the journalistic equivalent to a single figure salute to a man whom I have shown to be not only fooled by gossip, but also his company to be a routine thief and recently proven a liar acting in malice, self-interest and total disregard for Christian ethics that his proud Samoan culture claims for itself. Enjoy now as I share the background to its publication and more . . . 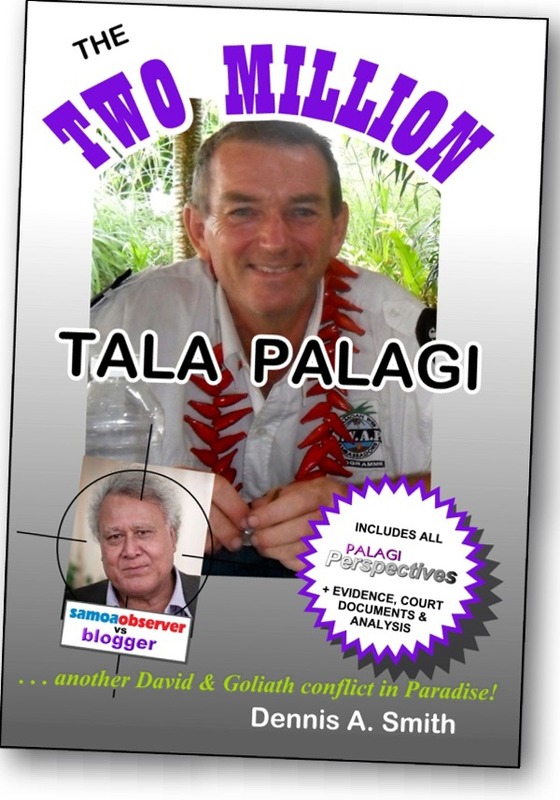 THE TWO MILLION TALA PALAGI . . . another David & Goliath conflict in Paradise! So reads the back blurb. Get the popcorn out . . . the gloves are off! (Editor-in-Chief of Samoa Observer) when it was time to pay! Let’s get down and dirty here . . . the Samoa Observer claims to have a high moral calibre but they’re actually hypocritical crooks. The editorials are spoken in the royal “We” and contain much pontification of biblical values standards and absolutes, yet the company has a reputation for not paying their bills. The owner presents himself as an award-einning saint, but when you start digging you find that he is hated by half the country and the other half are deluded that the sun comes out of somewhere in the lower part of his office. I’ve shown here and in this book that he’s a proven liar as well as having ripped me off. Welcome to the Paradise of Samoa where there are always two stories and we all live in the world of the make-believe. 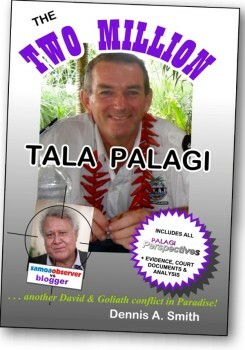 The publication of this book is a social crime in Samoa. I am therefore a social criminal. In a land of corruption and deception, that is a compliment. First you should never insult your elders. Oops, I just did, for I dared to suggest that one ‘big chief’ dude got fooled by gossip, then escalated his immorality into lies, lies and more. Secondly you should never take on powerful men, no matter how corrupt they are for they have the power. Oops, I just did. For the moment I’m still alive. If they ever find my suicide, take careful note that I’ve been suicided. Thirdly, you can’t do anything about the Samoa Observer because they will sue you and/or stop you advertising and effectively close your business down – you know, the Samoan gossip/vendetta machine sort of thing? Oops, I did and they did! Do two wrong make a right? Now fourthly, if you dare, just add in the racial thing. You’re not allowed to talk about racism here but if you’re a Palagi (that means you’re not brown skin born in Samoa or have any Samoan blood in you) then you are a target, you have no standing in society, and you CERTAINLY cannot say anything negative about a Samoan, and especially if you cause shame for Samoa and especially ESPECIALLY not if you’re right. Oops, I just did. Oops I think I am right too! This is a light-hearted dealing (except for the ‘suicided thing’ in which I was deadly serious, pun intended) with a HUGE issue here in Samoa and one that is well described by the events shared in the book. There’s a serious problem though, and it is this . . . I’m an author and an investigative blogger and until they kick me out, I live here, currently now for six years. I respect the truth, have a strong sense of justice and have no fear. Put simply, I am a square peg in a round hole . . . and I’m perceived as a threat, by many who believe the gossip and don’t know the real me. When Savea Sano Malifa ripped me off, I was patient, gave him opportunity to fix the matter, pleaded to his integrity and then left it for a while, a year, or two, and more then sued his company, for what was owing (no more) and then watched while he and his lawyers delayed things, played games and then dreamed up a scheme to whack me with a massive $2m defamation lawsuit. He’s a danger to the Samoan AND international business community and his conduct is a disgrace to the Samoan people and culture. I’m publishing the facts, my commentary and analysis prior to the Supreme Court hearing. I will use it in evidence. In my next post I will be sharing an Open Letter to Samoa Observer’s lawyer, giving her five days to request a copy of the book and a Right of Reply, the same with Sano, and then printing. As the book cover says, the gloves are off! The Book is 260 pages in 6×9 perfect bound. Only limited quantities of the book will be available in Samoa, I’ve dedicated the entire profits to the Samoa Observer so I’ll be giving many away – heh! Oops where did that evil thought come from? Seriously I don’t want to make money off the back of Sano and Samoa Observer, yet anyway. Sano and the PM will get a copy gratis even though they’ve both got the money. The PM will read it from cover to cover and laugh his head off because Sano is his nemesis and Sano will no doubt take it down to the little room for posterior use. I’m sure that half the country will want me to give them one too because Samoans are like that, oops, sorry I shouldn’t have said that either, but I can’t afford more than a few copies to spread around so unless Sano wants to print off a gazillion copies [yeah right!] and make a buck [Okay maybe?] it’ll be all low key on my side. You can place pre-orders by contacting me directly. Australia, New Zealand and Amazon will follow in due course no doubt. I won’t be making the book available in free PDF format like I do mostly for a while (or if at all) but much of the content is already online. Grab an autographed version while I’m still around – these guys can play dirty when you ruffle their feathers and this guy is a serious p*ssed off man not really able to think straight all the time. He’s no stranger to eviction from the drinking establishments and not unknown for violence either, so who knows? Enjoy the read and make sure you’re doing the right thing so we meet on the other side eh?